Established on August 08, 1979, Jagiroad College is a reputed college in the semi-urban area of Morigaon in Assam. Running the undergraduate courses in arts, science and commerce; it also is well known for its Post Graduate Courses in several subjects. Moreover, the career oriented programs and the vocational courses along with the distance education programs duly help the students pave their career path. Embracing a land area of about 25 bighas, it is located amidst the captivating natural beauty of Sonaikuchi Hils. Earlier known as Kapili Anchalik College, it is at a distance of about 100 meters from the National Highway 37. The details below can render you an overview of the college, and at the same time, you can also check the official website www.jagiroadcollege.co.in. 74 km from Guwahati, buses and taxis available from Guwahati. Nearest airport- Guwahati – 94 km. Buses and taxis available from the airport. Nearest Railway Station – Jagiroad Railway station, 22 km. Buses and taxis are available from the railway station. Undergraduate in- science, commerce, and arts. Career Oriented Programs, and Vocational Courses. 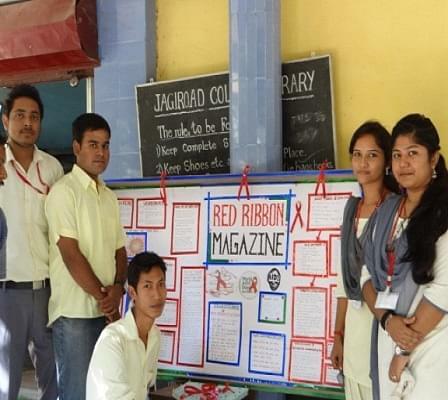 Why to join Jagiroad College? High Quality Education and Admirable Discipline: Being the best college in the region, it excels in education, all extracurricular activities, and in discipline. Highly Qualified Faculty: As per UGC guidelines, only highly qualified faculties are allowed to teach. Placement Assistance: Career Guidance, Counseling, and placement assistance is available to help the students pave their career path. Scholarships and Awards: Scholarships and awards immensely support and encourage the students to excel.